When the doctor first told Cathy she was pregnant with twins, she could barely believe it. She and her husband, Brad, were excited and looking forward to meeting their new son and daughter, who were due on December 5th. At 27 weeks, however, Cathy experienced some complications. She was hospitalized for 11 days. Brad and Cathy’s mother, Carolyn, stayed just steps away at Ronald McDonald House (RMH) Morgantown. Cathy was hospitalized two more times due to going into preterm labor. After the third time, her physicians wanted her to stay close by for monitoring. Her mother stayed with her at the Ronald McDonald House which was just across the street from her care. Cathy’s husband went home during the week to work but was able to join them on the weekends. Both mother and daughter were surprised by how comfortable the beds were and appreciated all of the meals made by the volunteer groups. Most of all they had peace of mind knowing that the hospital was so close by. “It would be hard to make the two-hour drive back and forth from home in my condition for my doctor’s appointment twice a week,” said Cathy. At 34 weeks, Cathy and Brad’s son and daughter were born. They are doing well and after a few weeks in the hospital, the family of four was able to go home. With a huge grin on her face, Lilah will tell you that her favorite space at the Ronald McDonald House (RMH) Pittsburgh is the playroom. For her mother Katherin, she finds comfort sitting and talking with the other families. Three-year-old Lilah was born with a rare kidney disease that had also affected her liver. After two years of receiving dialysis, Katherin was told that her daughter needed a multi-organ transplant. It was something she was not expecting to hear. Lilah’s physician additionally told Katherin that she needed the transplants quickly and advised her to look for living donors. With the help of family and friends, Katherin found two matches. In the summer of 2018, Lilah had both transplants just one day apart. While Lilah was recovering, Katherin stayed at RMH Pittsburgh. At times her family stayed there with her. It meant a lot to Katherin and Lilah to have family there with them. It was especially meaningful when Lilah’s big sister could visit. Lilah and her mom would prepare for her sister’s visits by baking cookies in the community kitchen. 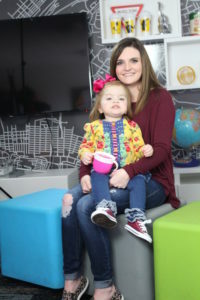 After three months, Lilah was able to go home to Mississippi where she could be with her big sister. “The Ronald McDonald House has been a blessing, it has become our second home,” said Katherin. Benny’s mom, Tasha, describes her son as a fighter because that is what he has been doing since birth. Born with several heart defects, Benny had open heart surgery at only two weeks of age. Not long after, he suffered a stroke. 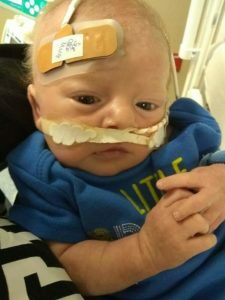 His journey has taken Benny’s family to both the Ronald McDonald House Morgantown and the Ronald McDonald House (RMH) Pittsburgh. At her 20 week ultrasound, Tasha received the news that her baby had multiple heart defects. Because her community hospital was not equipped to handle his birth, Tasha would need to deliver an hour from home at a hospital in Morgantown. Following Benny’s birth, his parents and big brother were able to stay near him at the RMH Morgantown. As Benny grew stronger, the family of four was able to go home but only to return following some complications. Benny’s physician decided to transport Benny via helicopter to Pittsburgh to be put on ECHMO, bypass life support. Benny continues his fight now more than two hours from home. His mom, dad and big brother remain right there by his side. This time they are staying at RMH Pittsburgh. “Being close to him is paramount,” said Tasha. “It is because of the Ronald McDonald House that I was with him the first time he opened his eyes,” she added. For six hours each day, five-year-old Jaxson can leave his hospital room and join his mom at Ronald McDonald House Pittsburgh. 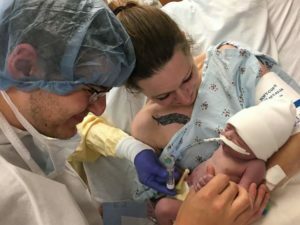 “It’s so nice, he gets a break from being in the hospital and it gives us a sense of normalcy,” said Katie, Jaxson’s mom. Jaxson has been in the hospital for the last three months following an intestinal, liver and pancreatic transplant. His physicians tried to delay the procedure for as long as possible, but in March of 2015 he needed to be placed on the organ transplant waiting list. Nearly three years later, he and his mom received the call that took them from their home in Arizona to Pittsburgh. 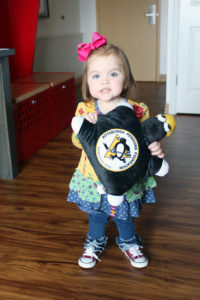 Katie has been staying at Ronald McDonald House Pittsburgh since the day they arrived. She appreciates all the House has to offer including only being steps away from her son’s hospital room and the meals that the volunteers make for the families staying there. In addition, both Katie’s mom and daughter have been able to visit and stay with her at the House for a period of time. “I love that, you don’t feel alone,” said Katie. She is especially appreciative of seeing her daughter whom she hadn’t seen in nearly two months. And according to Katie, she felt that Jaxson seeing his little sister has really helped with his recovery. 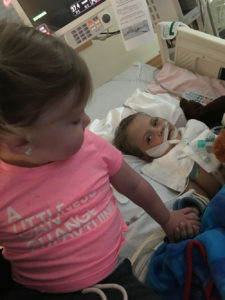 Jaxson and Katie may be able to go home soon and rejoin the rest of their family. Something they are both looking forward to. They will be back though because Jaxson has rejected his small intestine and will once again be placed on the organ transplant list. Jaxson’s fight continues and mom will be there right by his side. Although being far from home is never easy for the thousands of families served at Ronald McDonald House Charities of Pittsburgh and Morgantown each year, it is our hope that by providing comfort and support we can help alleviate the stress of the situation and give families the opportunity to do what they need to do most – focus on their children. 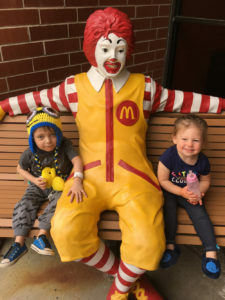 Skylar, Lily, Kayla and their grandmother, Linda, were first introduced to the Ronald McDonald House Charities of Pittsburgh and Morgantown when they stayed at Ronald McDonald House Morgantown. Skylar, 15, was having kidney issues that required her to be hospitalized. Shortly thereafter, she was transferred to a hospital in Pittsburgh for a kidney transplant evaluation. Just four months later, she received one. While Skylar was in the hospital for her surgery, Lily, Kayla and Linda were only a few steps away from her, this time at the Ronald McDonald House Pittsburgh. Staying there meant they could be by Skylar’s side the whole time. 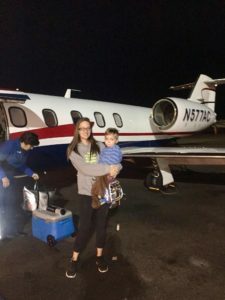 And even though Skylar is now home and back to school, this family of four continues to travel four hours once a month for her medical care, each time staying at the charity. “From the very beginning the process was easy,” said Linda. “They tell you about the meals that are prepared by the volunteers, set you up with your linens and just help you get settled,” she added. Nearly a year later, the Ronald McDonald House has become their “home-away-from-home.” “Every time Lily and Kayla walk into the House, they automatically look for the coloring books and then make a bowl of cereal. They know exactly where to go,” said Linda. So often, Linda is not sure how long they will be staying at the charity. Skylar’s appointments can vary and recently they had to make an unscheduled medical trip over the holidays. During this time, the girls were able to meet the characters from Frozen at a Ronald McDonald House holiday party. “It was so much fun for them,” said Linda. “They just make everything special,” she added. 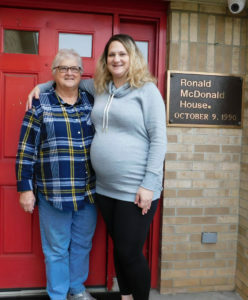 The Ronald McDonald House has given Linda and her granddaughters the opportunity to be together throughout Skylar’s medical care. As Skylar continues her recovery, her sisters and grandmother will continue to be there. “It’s important for Skylar to have everyone be a part of this and at the Ronald McDonald House we can,” said Linda.